One night's stay cancellation fee, in the case that cancellation will take part one month prior to the arrival day. Every Month, expect June, July and August. 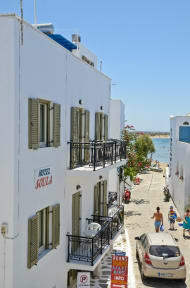 A friendly family run hotel & hostel located in the sandy Saint George beach. It offers free transfer from/to the port and airport, free luggage storage, free internet access, free wireless internet and free map. Soula Hotel and Hostel is only a 2 minutes walk from Naxos town centre (250m from main Naxos square and 400m from big nightclubs and late night bars). It is a small sized economy hotel with rooms, dorms and studios. All comfortable and bright rooms and studios have a balcony, bathroom, daily cleaning service, satellite TV, refrigerator, a/c, direct-dial phone, music, safety deposit boxes (reception), shower and WC. Also studios have kitchenette with all cooking facilities. All dorms have private bathroom, balcony, refrigerator, safety deposit boxes (reception), shower and WC. Also the hotel offers free transfer to/from port and airport, free luggage storage, free internet access (ADSL), free wireless internet, parking area and TV lounge. 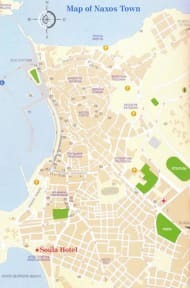 Free map, excursions, car rental, etc via reception. This family hotel and hostel is located about 800m from the harbor, 100m from the centre and only about 30m from the famous Saint George beach. Great location, clean and friendly staff! Staff was friendly and picked me up at the port, with the option to drop me off as well. But once I found my way around I opted to make the short 15 minute walk there after checking out.The hostel is just a stones throw from the beach, a 5 minute walk to the bars and restaurants near the port and maybe ten minutes from the temple of Apollo. Laid back chill vibe, with perfectly nice facilities. Nothing too fancy, but perfect for a beach weekend. Location in town is great. Very close to the beach and less than 5 minute walk to main town square and 10 to the port. The room was comfortable and had a closet and a large balcony. There was also access to the rooftop for a nice view of town. This is a great place to stay if you want somewhere chill, quiet and relaxed. It’s more like a hotel than a hostel so if you want a more lively atmosphere I wouldn’t suggest this place. However for me it was great as I needed to relax. It’s right by the beach too! Great social hostel, close to every service, 5 minutes away from the port. The staff was helpful even though they barely spoke english. No lockers for backpacks and other items and its pretty easy to access the rooms from the balconies, so be sure to lock your doors! Soula hotel offers a laid back atmosphere, and the hotel itself is very clean. However, it’s not the most social place and not sure if its because we went in the off season (Oct), but there was no staff around past 7pm some nights lol. Also no kitchen so you can’t do your own cooking. They offer to pick you up and drive you back to the port which is great though! Wasn't bad wasn't amazing either. I stayed in the dorm which was 4 beds (only 2 are bunks). There are no lockers but the girls in my room were great. We had a little terrace which was nice. Everything was clean but "lived in". The location is perfect (2 minutes to the beach, 5 minutes to town). Wifi was good in the hotel but in the dorm none of us had any cell service (we could go online but not call or text). As soon as you step outside (even on the terrace) it was fine, though.